I've always felt ambivalent about annuals. The best are the ones where the regular creatives use the extra room to tell an epic story that's either too large an idea for an ordinary issue or else climaxes a storyline, or someone you've wanted to see handle the characters shows up to write or draw the book. The worst are when some ill-suited guest team butts in with crap that's essentially filler or else it's simply part of a storyline from some other book. Back in the 1960s, the gang at Marvel really knew how to put together an annual, although Fantastic Four Annual #3 (October 1965) consists of a regular-length story and some "most requested" reprints. 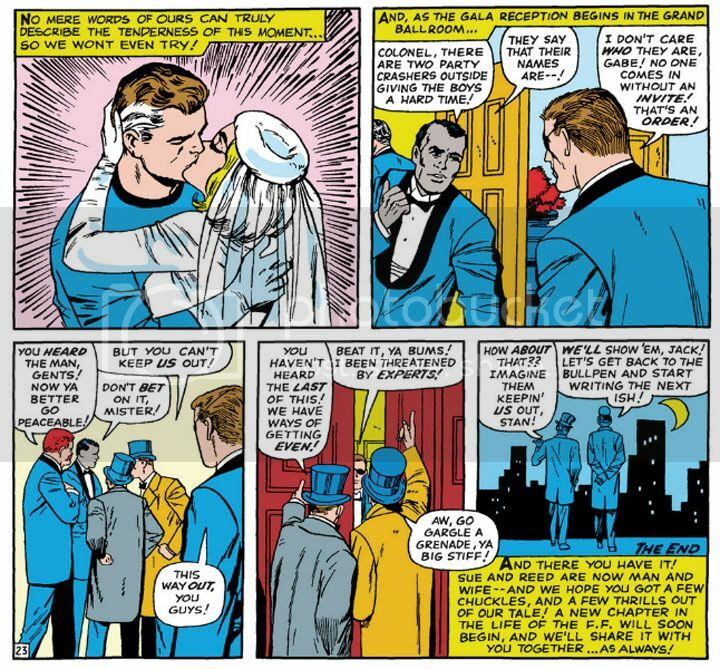 It's just the main story is nothing less than the long-awaited wedding of Reed Richards and Sue Storm. And lemme tell ya, brothers and sisters, everyone who is everyone shows up and it is fun, fun, fun from panel one! Captain America, Thor, Iron Man, Spider-Man, Daredevil, Dr. Strange and all the X-Men, plus Patsy and Hedy, (at least rumor has it) Millie the Model and possibly Irving Forbush headline a stellar guest list, with Nick Fury and SHIELD providing security. The only problem is, with such a major event there are bound to be crashers. The Puppet Master, the Red Ghost and his apes, Mole Man and the Super-Skrull all cause problems, because Dr. Doom himself has some kind of crazy emotion ray controlling their minds. The heroes prove capable of handling the initial wave, but more and more villains attack so we get the like of the Mandarin and Hydra plus a lot of other clowns whose names escape me barging in and smashing up the place (kind of like Owen Wilson's mescaline-addled Eli Cash in The Royal Tenenbaums only without the death of a single Buckley), giving Fury a raging headache. When Attuma and his Atlantean armies emerge from the harbor (Doom meant to call Namor, but the King himself was on some deeper quest according to Stan Lee's little editor's note; he also tells us why the Hulk isn't there) and Richards puzzles out what's behind it all, even the Watcher has to take a hand. He takes Richards on a dazzling yet possibly superfluous trip through the "fourth dimension" (isn't that time?) to retrieve a device that beams all the baddies backwards in time to a moment where they would forget the whole thing happened. 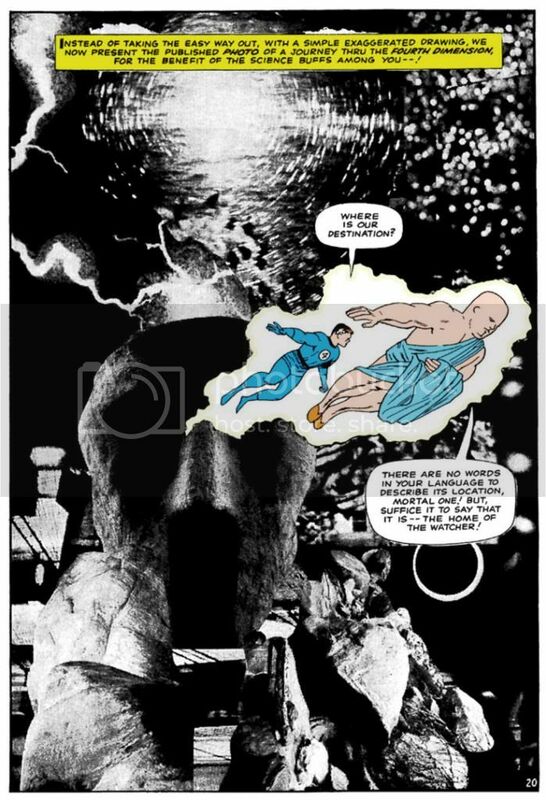 Kirby uses one of his patented collages to depict the dimensional trip and we have to take a moment to gaze upon its wonders. And here's that aforementioned device in action. My god, Reed Richards is so smart, he could tell just by looking at it what it is and what it's used for! I'm looking at it and all I can think is maybe I could use it to project transparencies onto some kind of fabric screen or perhaps even the wall itself as a visual aid for one of my classes. This panel sums up the whole of the rather jangled plot, which is almost entirely given over to fight scenes, as you can imagine. 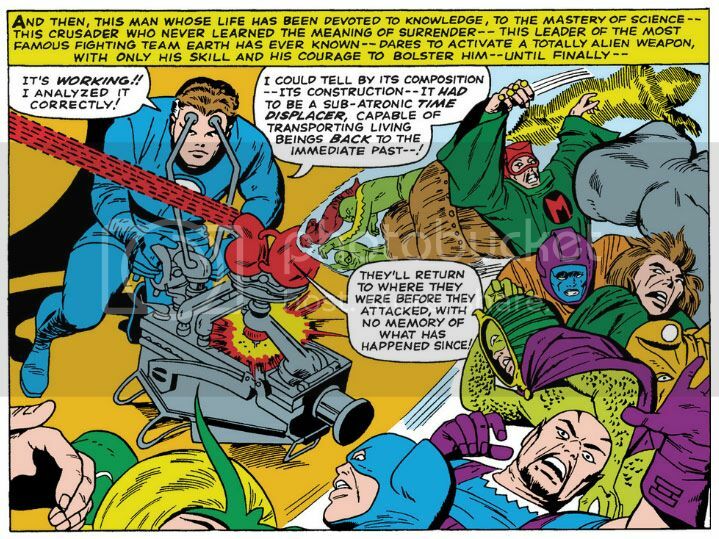 Kirby's on fire with some incredibly energetic poses as he presents practically an encyclopedia of Marvel's contemporaneous characters and we get a lot of villainous monologues and heroic wise-cracks from Lee. Vince Colletta's inks are typically scratchy and rushed-looking, but I also recognize the herculean task faced by the art team here in working with this many characters on deadline. They're serviceable finishes and a few odd figures and faces actually have a becoming elegance (others look kinda haphazardly slapped together), but certainly this book would have looked slicker with Chic Stone doing the honors, or Joe Sinnott. 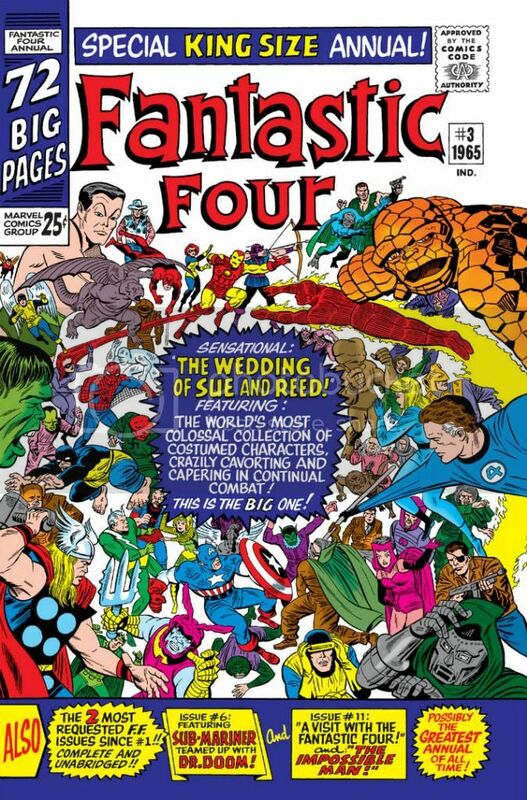 Then again, Reed and Sue might have had to delay their ceremony another year or two waiting for this issue. Another thing to consider is we're looking at restored art here. I'm not sure what process Marvel puts their back catalog through to produce these color reprints, but I doubt they used the original inked pages or old separations (if any of that still exists). I'm guessing they cleaned up some stats or decent-quality printed books as best they could, retouched things here and there but said, "Eh, good enough" at the loss of finer lines after the digital coloring. And these lines look like they were thin enough to begin with. Stop the music! Stop the music! Hold the sub-atronic time displacer! What's this? Two more wedding crashers? In the immortal words of a certain bashful, blue-eyed boy, "Wotta revoltin' development!"